Subtractions: Ruffled Feathers. 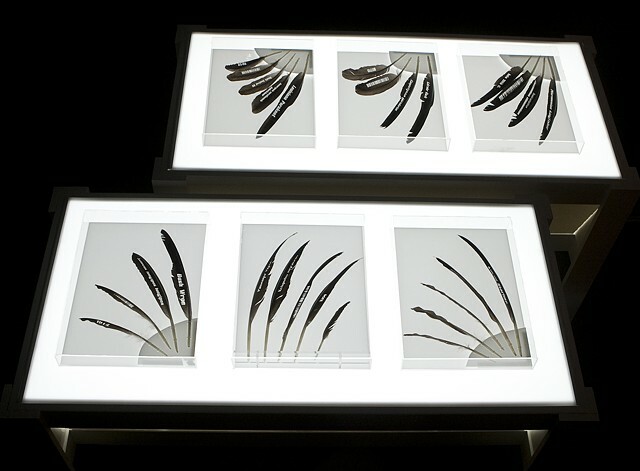 This series of 6 plexiglass boxes (each 12 x 2" x 16) uses Canada Goose feathers as the medium to remind us of the damaging effects of human-induced monoculture. Feathers are imprinted with the names of extinct bird species, the last date they were seen, and their bar code representations, bar codes being a reference to our manipulation and commodification of the natural world.